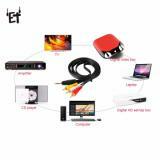 ET SY-2 3.5mm RCA Audio Video Cable, which is designed to connect 3.5mm male plug to 3RCA Audio Video female, adopts soft material to ensure long service time. Just take it. 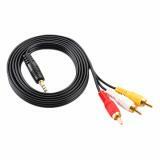 3.5mm RCA Audio Video Cable is designed to connect 3.5mm male plug to 3RCA Audio Video female that is compatible to video or audio equipment with RCA type jacks: DVD player / recorder, VCR, TV, Camcorder, Hi-Fi Stereo, Receiver. High quality pure copper wire core with ultra-high speed data transmission and Soft flexible PVC bend material provide practical use and enhance durability for long time. 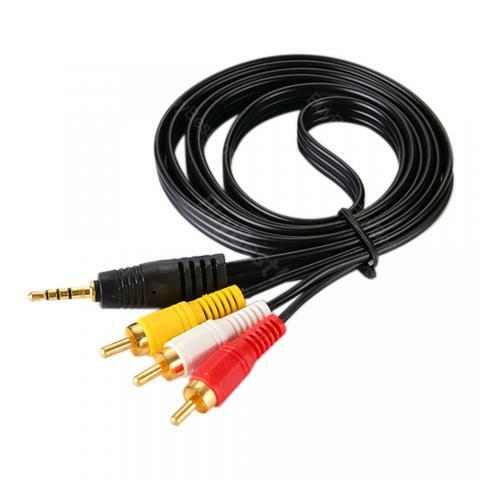 Convenient and cost-effective stereo to RCA audio adapters provide spare or replacement 3.5mm audio cables to carry with you and keep at the desk or in the car. was completely blown away by the quality of this cable, i purchased an RCA brand cable from the local Walmart 2 months ago and it started clicking and popping any time you touched the cable and didn't let it sit flat, eventually it stopped working completely. 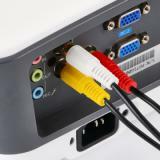 i was cautious because of the "AmazonBasics" but comparing it to the Monster cable brand i have for my TV its on par evenly, connectors are firm, the fittings are polished and high quality metal, cable is thick and seems very sturdy yet flexible. will definitely purchase again, hopefully in the far future! Simple cables that get the job done. 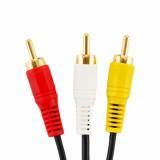 Using these as part of an HDMI to Component Video converter setup and couldn't be happier. Love the fact that the cables are individualized by color and function. Cables seem sturdy and look like they will last. Would happily buy them again. this product is really recommended.Pretty standard and good quality. Gives some of the newer tv's an extra input. I had a dilemma while traveling in my RV. With a builtin stereo/DVD player in my rig I needed a way to capture the signal and display on the RV TV. Cables where available near the TV and this splitter cable solved the challenge of video/audio displaying on my TV. Very happy with the product and quality. The value of this product exceeds the price I paid, speedy and great quality, I would highly recommend! The cable looks the same with the original lost one. Works well. Like to shop at buybest. The price is reasonable and the quality is trusted. 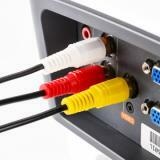 Easy to find the cable, this is what I want.